Each page of the book opens a new way of looking at forgetfulness. For example, if a person with forgetfulness seems to be always looking for food, the doctor suggests, “provide fruits or raw vegetables.” The authors did not go further into the topic of eating, but in a future exploration of this topic, they might look into whether the desire to eat represents some under underlying emotional or sensory desire (i.e., for companionship, touch, love). The authors point out the attitudinal shift of Robert Butler, pioneer reminiscence therapist, who recalls that tin the 1950s, “living in the past” was seen as a symptom of senility, “as one of the signs of living a meaningless life.” He states, “Far from living in the past or exhibiting ‘wandering of the mind,’ as was commonly thought, older people are engaged in the important psychological tasks of making sense of the lives they had lived.” In this section, and throughout the book, goals and assumptions, techniques, and characteristics of the therapy are described. Over six pages of bibliography are provided for further research into the topics of dementia, alzheimer’s, and forgetfulness. Less than 130 pages, and presented in a clear, inviting format, this book is a must for family members who have a loved one with forgetfulness, as well as researchers, hospital workers, professional healthcare providers, interns, and teachers. 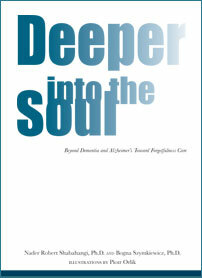 Deeper in the soul: Beyond dementia and Alzheimer’s Toward Forgetfulness Care is published by Elders Academy Press, www.elderspress.org.